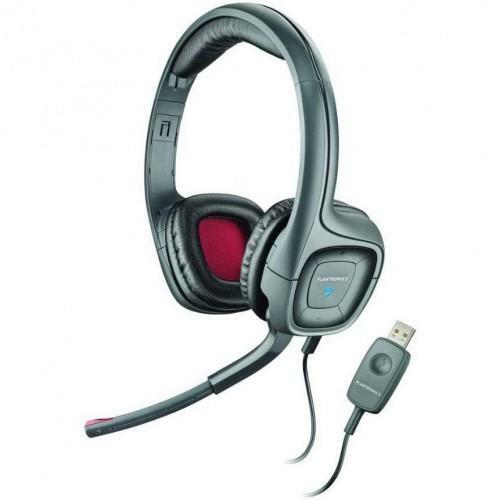 Маркирани оферти за Plantronics Audio 655 (80935-15) Как са подбрани? С два 40mm говорителя, от които се чува ясен дигитален звук, слушалките Plantronics Audio 655 са перфектни за всичките Ви нужди. Комбинацията от отлекотен дизайн и шумоизолиращ микрофон гарантира комфорт при употреба, както и високо качество на интернет разговорите Ви. This headset simply delivers quality digital hi-fi stereo sound for all of your PC audio needs. With a full speed plug-and-play USB connection and one-touch volume controls right on the earpiece youll experience deep bass and full-range digital audio through 40 mm stereo speakers. The noise-cancelling microphone with wideband acoustic echo cancellation makes your conversations crisp. Fast Mic Mute technology lets you quickly mute the microphone by raising the boom. The headsets pillow-soft, swivel-mounted ear cushions and lightweight design enable all-day wearing comfort so you can listen to music and podcasts, make internet calls, play DVDs, games and more.